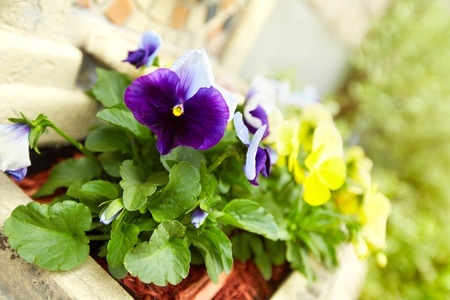 By the time spring arrives, most of us are thrilled to see the sun shining and the flowers blooming. For we gardeners, springtime is especially welcome, because it's the first opportunity of the year to plant beautiful veggies and flowers. But if you're not careful, that spring garden can wreak havoc on your budget. Here are some ways to save on your gardening costs. * Plant perennials. Perennials are plants that come back every year on their own, so you don't have to buy new seeds year after year. Petunias are perennials, even though most of us pull them out at the end of each season. Cut them back and leave them over the winter and they'll grow and bloom again, saving you money, time and energy. * Harvest seeds from your annual plants so that you can sow them again the following spring at no additional cost. Let the seeds dry, store them in labelled bags, and keep them in a warm, dry place for the winter. Plant them in seedling trays and place them in a window when spring is near, and they'll be ready to transplant when the weather is suitable for it. * Ask fellow gardeners for cuttings from their plants. Friends and neighbours are often happy to give you a start from one of their plants that you admire. I currently have 23 lavender cuttings growing from my mother-in-law's garden. * Plan your garden carefully. It's helpful to draw a diagram to scale and determine which plants you'll plant where. This will keep you from overspending by buying too many plants and it helps with crop rotation and succession planting too. * Be sure to do your planting at the right time. It's important to wait until there is little chance of frost. If you don't, a frost could obliterate all your hard work and leave you with few or no flowers. Once you've planted, keep an eye on the weather forecast and cover your young plants overnight if frost is a possibility. * Take care to make sure all of each plant's needs are met. Some need to be exposed to the sun all day, while others should be planted in shadier areas. Some plants should be planted deep in the ground, while others do best just below the surface. And space requirements vary significantly. These specifications should be listed on your plant's tags or the seed packet. If you're unsure about a plant's requirements, you can find out all you need to know online or from a good gardening book. * Make your own fertilizer. Compost coffee grounds, food scraps and grass clippings, and add them to your garden. This works just as well as store-bought fertilizer, and it's much cheaper. There are plenty of ways to have a beautiful and productive garden without spending a lot of money, these are just a few ideas you can easily use.